#28, Lawyer Jaganathan Street,(Harsha Toyota Building)Alandur, Chennai - 600016. 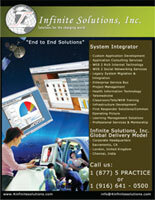 Learn more about Infinite Solutions Inc., and see what services it has to offer. A latest technology in healthcare, Infinite Vista provides digital electronic medical records accessible from anywhere in the world. 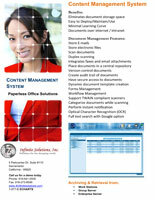 Advance Content Management System that offers a paperless Office Solutions. InfiniteLMS is a Web 2.0 Rich Internet Application that helps students, instructors, and researchers to collaborate and improve the learning experience. High Definition Telepresence that offers the benefit of face-to-face interaction with video communication that is absolutely simple to use. eMonitor is a secure monitoring platform that monitor infrastructure and facilities all in one tool. 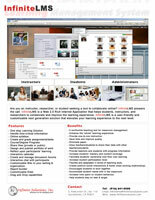 eCommunicator is a secure communication platform for communicating within and outside the department. A Web 2.0 application that allows multiple command centers to view a single identical display of considerable information.